Here you can see how to import Diving Log logbook files, which has been improved from version 4.0. Now you have more control which data will be imported, so you can use it to exchange data with logbook files from other users, e.g. you only have to enter new dive sites once, and then import them into the other logbook files. Another new feature is the automatic backup before critical operations. Diving Log has a backup function (which is not yet included in version 5.0), and you should additionally backup your logbook file regularly to a secure location, but sometimes it can happen that you edit something and save it to the database and want to undo it. But due to the characteristic of a database, deleted records and other changes cannot be undone. In the latest version every time you delete something or sync from a device (iPhone, Windows Mobile device) back to the PC, an automatic backup file will be created before. 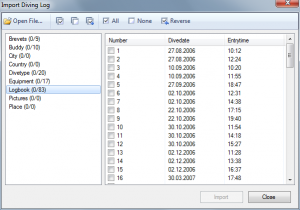 The backup file has the same name as your logbook file, but with the extension *.bak, e.g. Logbook.bak and is stored in the same location. 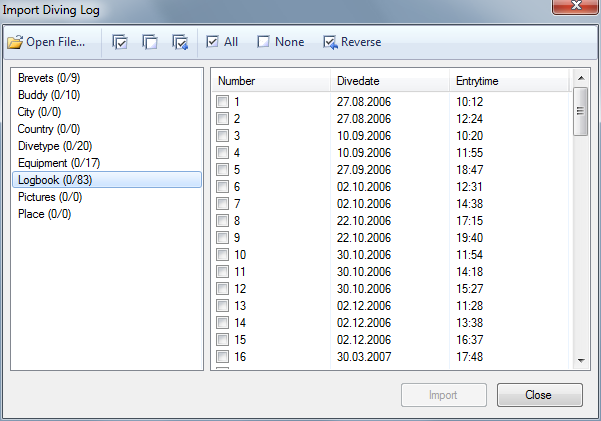 If you have made a mistake and want to undo it, close Diving Log, rename your logbook file (e.g. to LogbookOld.mdb), make a copy of the backup file and rename the extension to *.mdb and open this file in Diving Log. The feedback of the Release Candidate 1 was overall positive and revealed a number of bugs which were not found during the beta period. Thank you to all testers so far! This entry was posted on Tuesday, January 12th, 2010 at 9:50 pm and is filed under Diving Log 5.0. You can follow any responses to this entry through the RSS 2.0 feed. Both comments and pings are currently closed.